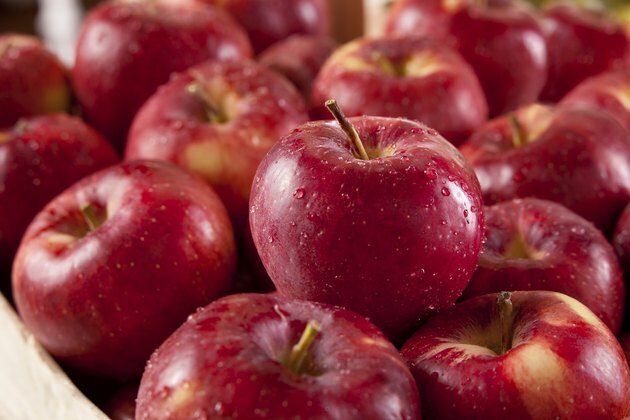 In addition to the low calories and the high fiber, the acid found in apples makes them a smart choice for building and maintaining good health. In fact, apples are a rich source of ascorbic and malic acid. Apple cider vinegar, which is produced through the fermentation of apple juice, also contains acetic acid, which contributes to the sour taste of the product. The pH scale -- which ranges from 0 to 14 -- is used to determine the acidity or alkalinity of various substances. Items that have a pH of between 0 and 6.9 are identified as acidic, while those that have a pH of between 7.1 and 14 are alkaline. Depending on the specific variety, the pH of apples may be between 3.2 and 4.0. Apples do contain acid -- which is reflected by this low pH. One medium apple contains around 8 milligrams of ascorbic acid -- or vitamin C. According to the National Institutes of Health, adults should aim for between 75 and 90 milligrams of vitamin C each day. While vitamin C performs a number of important functions within the body, it is especially crucial in wound healing and boosting immune function. A diet rich in vitamin C might also help prevent certain cancers and cardiovascular disease, though more research is needed to know how well it works. Malic acid is made naturally in the body when carbohydrates are converted into energy, and it is crucial when it comes to promoting normal muscle function. People who are deficient in malic acid may be encouraged to eat more apples, which are a rich source of this substance. Apple cider vinegar is made by pressing raw apples and allowing the extracted juice to ferment. As with raw apples, apple cider vinegar is a rich source of acid -- especially acetic acid. Acetic acid may help keep blood sugar levels and insulin response in check. Along with acetic acid, apple cider vinegar contains citric, lactic and malic acids.